The Way was the first Christian movement started by the disciples, those who knew Jesus and learned directly from His teachings. The ones who would most likely have been able to mirror-image the Son of God. And he entered the synagogue and continued speaking out boldly for three months, reasoning and persuading them about the kingdom of God. But when some were becoming hardened and disobedient, speaking evil of the Way before the people, he withdrew from them and took away the disciples, reasoning daily in the school of Tyrannus. This took place for two years, so that all who lived in Asia heard the word of the Lord, both Jews and Greeks. About that time, serious trouble developed in Ephesus concerning the Way. It began with Demetrius, a silversmith who had a large business manufacturing silver shrines of the Greek goddess Artemis.He kept many craftsmen busy. At that point Felix, who was quite familiar with the Way, adjourned the hearing and said, “Wait until Lysias, the garrison commander, arrives. Then I will decide the case.” He ordered an officer to keep Paul in custody but to give him some freedom and allow his friends to visit him and take care of his needs. It was shortly before the Way formed that the followers of Jesus were called Christians. The body of Christ has since been sliced and diced like a chopped tomato on the butcher block for centuries. Hm…I have an inkling of who the chef might be. Here’s a hint: The guy used to be an angel and now he’s a fried chicken. The problem is something like this: A Baptist preacher can’t worship alongside a Pentecostal minister because man-made additional church doctrines tacked on to the Bible like an eleventh hour hidden agenda rider to a Constitutional amendment gets in their way of following what Jesus taught. How’s that for irony? In an attempt to be holier than thou, both of them fall away further from the Truth than when they started. Man-made doctrine is the death of the Church. Like man-made sugar causes cancer, man-made religion isn’t doing anyone any favors. People will argue about if the earth was really made in 6 literal days or if each day was a 1,000 years. When it boils down to it, does it really matter? Getting bogged down in one aspect and forsaking the message as a whole is like when you took the SAT test and the teachers said if you get stuck on one question, move on before time runs out. Friends, time is running out. I take the Bible literally and think it was 6 consecutive 24-hour period increments, but I’d rather spend my time teaching and preaching the Word of Yeshua HaMashiach, you know? Our mission is to seek the lost and bolster the saved, not argue over things Jesus never worried about. It’s like we’re too scared to get into the streets to minister to the nonbeliever, so we stay at our desks, noses in our books, trying to dissect the Old Testament when we’re products of the New Covenant. That’s just crazy. People use this verse to say, “Look here. The Bible says a day is like a thousand years, so it wasn’t six literal days!” Okay, if that’s true…then it was really 6,000 years? Still a far cry from millions and millions – which some church doctrines are now entertaining! In this verse, Peter was talking to the church as a whole about people’s impatience with the length of which it was taking Jesus to return as He said He would. Peter reminded them that a day to Jesus was nothing – because God is OUTSIDE OF TIME! The Lord was and still simply is waiting on more people to come to the cross before the end of the age because He wishes for all to have ample opportunity to be saved. It had nothing to do with how long a day was concerning the creation of the planet. Another example of people “copy and pasting” the Bible as they see fit. Sad, sad, sadness. Back to Christianity, as it is meant to be, which is NOT A RELIGION. Not man-made. It’s God-made. It is a way of life for us. A relationship with the Son of God. A walk with our Creator. So the 10 Commandments, something that the Israelites had so much trouble following and sacrificed an obscene amount of sheep and rams in repentance for, is laid out by Jesus as something we can all do. His words aren’t vague. They aren’t left open for interpretation. They are perfectly clear. 38,000. What’s that number for? That, dear friends, is the reported amount of different Christian denominations across the world. Give or take a few bogus or redundant ones and you still get a ridiculous amount of groups who think they are the best and only way Jesus wanted us to learn about Him. Arrogance x 38,000 = What? But even before thinking about the Way, what prevents each one of us from reading the Bible and listening to Jesus for ourselves? Okay, wait, therein may be a bigger problem than allowing “organized” religion to parade us around as blind sheep. If we all start to discern for ourselves what the Bible says, won’t that make about 2 billion new denominations? I don’t think so. As I stated earlier, Jesus’ teachings are key. Yes, the rest of the Bible is paramount to our overall knowledge and understanding of God – the whole Bible points to Jesus anyway! – but the way we should live our daily lives and conduct ourselves, both publicly and privately, rest solely in the direct teachings of our Messiah located in the New Testament. Teachings that leave little room for interpretation to the hungry student – and that means little room for multiple understandings! Bye, bye divisions. But, what about the parables? Jesus spoke in parables, sure. And He said that they weren’t meant for all people to understand them. However, that only means that not everyone will understand them because THEY CHOOSE NOT TO. The truth, His truth, wasn’t easy to swallow. It convicted many people and called for everyone to turn away from sin – something people loved too much to abandon. So His parables are for you if you want them to be for you. His teachings are for you if you want them to be for you. His Way is for you if you want it to be for you. Jesus is for you if you are for Him. Forget religion. It divides. Drop it and pick up a life-long relationship with the only begotten Son of God. His Way is the only way. Jesus even said He was the “way.” I trust Jesus. Whatever He says, goes. And with that in mind, I go back to the denomination situation. Why do they exist again? Oh yeah. To control people and distract them from true worship and fellowship with God. I’ll use God and Jesus intermittently because the two are the same. God the Father in Heaven. Jesus the Son came from Heaven to be born of flesh and die for our sins to then ascend back to Heaven and be on the Father’s right. In turn, the Holy Spirit, the essence of God, came and continues to dwell among and inside every true believer in Jesus Christ. This wasn’t a tangent, this was laying solid Biblical groundwork for forging a new path for those who want to follow and only follow Jesus – and that’s it! If you could only read four books in the entire Bible, read Matthew, Mark, Luke and John. But, if you could only read one book, read John. The Word is God. Jesus is the Word. Jesus is God. Follow Him, follow His teachings…follow His Way. Don’t be a denomination, be a disciple. Despite the division, we should still assemble and fellowship with other believers. However, since we are the church, wherever we worship Jesus hears and joins us. The suggestion is to find a church that preaches from the Bible and not their employee handbook. Don’t worry about religion, focus on relationship. A good church will teach you that. That kind of church deserves your 10% (tithe) because they are part of the solution – and we definitely need a solution. Rightly dividing truth. This can’t possible mean anything contained INSIDE the Bible because the Bible is “God breathed” and He cannot lie. Therefore, this must mean truth versus anti-truth OUTSIDE of the Bible. 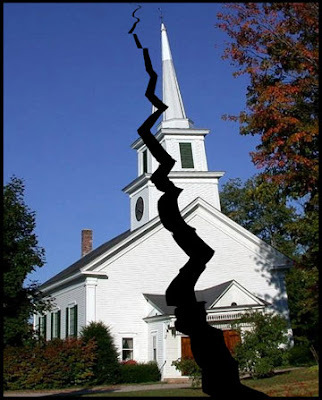 Rightly divide –correctly pull from – the truths we are told…from 38,000 different denominations!? Nice and daunting, huh? But, look at it this way. If we collect everything that we have ever been told is the truth like sand in a bucket, dump it in a sifter and see what’s left in the tray…we’d find a Rock. Jesus Christ. The rest is dust. That’s rightly dividing the word of truth. That’s pushing denominational division aside for a relationship with our Lord. Amen to that.